Eight 16-Bit analog input channels. 0-10V and 4-20mA options available. Reports the current reading along with the minimum, maximum, and alarm values. Supports Conditional Search with user-selectable conditions. The 1-Wire Octal (8 Channel) Input device offers an innovative way to monitor up to 8 analog points. In addition to the current reading, each point maintains a minimum value and a maximum value. High/low alarms may also be set independently for each input. The nearly instantaneous automated responses made by the LED and optional relay allow appropriate reactions (activate fan/alarm siren/etc) to occur before the monitoring application is even aware of an alarm. 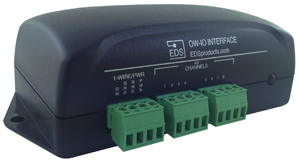 The Octal input has been designed to simplify the reading and controlling process; and therefore any general-purpose 1-Wire host adapter is able to read the analog points. All of the data is contained in five 32 byte memory pages which are updated in real-time. More in-depth information on the memory format is available within the downloads section. Q: How stable is this product and company? I see several items discontinued in the web pages. This analog input device looks like a fantastic way to increase my one wire network to monitor more IOT Devices. I am just a little concerned about investing down a path that may or may not have a future?? On a 4-20ma IOT configuration, how many of these octal input cards can reasonably exist on one maxim usb device? Currently I spend about $300/8 4-20ma devices taking them to Ethernet plus having to install the Ethernet cabling. I already have a 1-wife network in place for just temperature monitoring. Thank you for your inquiry. 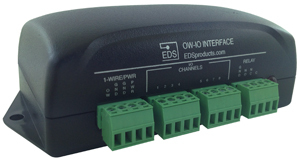 EDS' 1-Wire products are growing substantially in both unit sales and profitability. OW-IO-AI8 product line is a relatively new (2013) product that will be continued for the foreseeable future. We are also continuing to invest into our 1-Wire technology through a number of firmware developments to our OW-SERVER and the release of the MeshNet Gen 2 sensor which offers 1-Wire temperature probe support within our wireless line. In regards to the discontinued items in the Discrete/Analog IO section, the OW-IO-DIO8 was introduced to replace the GP1 after the DS2423 was no longer able to be sourced. The relay modules T1SS (2011) and T2SS (2013) were discontinued years ago. 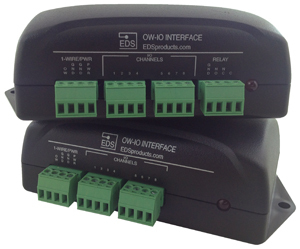 We have moved to offering the relay functions as an option to our OW-ENV and OW-IO lines instead of being a stand alone product. Many (How many do you need?) of the OW-IO-AI8 may be connected to the DS9490R assuming the DS9490R is not being tasked with providing the 5V dc to the OW-IO-AI8. If it is, the DS9490R# should be able to power two units. I'd also suggest considering our OW-SERVER-ENET-2 to read the OW-IO-AI8. * The time from a change in input voltage to viewing the result on a computer consists of many delays in addition to the conversion time (i.e. time to read the device on the 1-wire bus, computer processing time). Alarms, peak, minimum and maximum values are computed for each reading, so these parameters have an update rate of 8 * 120ms = 960ms. ** Input currents outside this range is permitted, but will not read correctly. *** Input voltages outside this range is permitted, but will not read correctly.